Private feeding stations with cardboard boxes and electronic cat doors to manage up to five cats' different dietary needs. If you have several cats in your household, you probably know how difficult it can be to keep each cat away from another cat's food if one or more of your cats is on a prescription diet from your veterinarian, or if you have an overweight cat who needs weight-management formula. 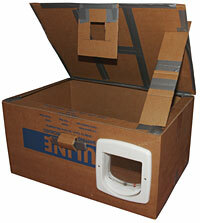 Make your own Food Boxes to isolate up to five cats' food access to ensure they can each meet their individual dietary requirements.